Fyodor Mikhailovich Dostoyevsky (October 30, 1821 - January 28, 1881) was the second of seven children born in the family of a doctor at Moscow's Mariinskaya Hospital (now a medical research institution). His father was a very strict and authoritative man who was often cruel to the children and other people. Fyodor's mother taught him how to read and write. He also studied religion and French at home. In 1834, his father sent him to one of Moscow's best boarding schools. There, he was drawn to literature and reading. He adored Alexander Pushkin and called him "demigod" and a "prophet." Pushkin's death in 1837 was a shock for Dostoyevsky. His mother also died that same year, which was another heavy blow to him. His father was murdered by his own serfs in 1839, when Dostoyevsky was eighteen and attending school in St. Petersburg. Fyodor studied to become a military engineer, but after his graduation, he decided to live off his literary works alone and "work like hell." His first novella "Poor Folk" was ready by that time, and he published it in Nikolay Nekrasov's "Petersburg Collection" to extraordinary success. The following years Dostoyevsky wrote a number of novellas, including "The Double", "The Landlady", "White Nights" and "Netochka Nezvanova". Though his early works are often perceived as experiments in different forms and subject matters, they also revealed Dostoevsky's unparalleled realistic style, deep psychological insight and the uniqueness of his characters. On 23 April 1849, he was arrested because of his connection to an antigovernment group called the Petrashevsky's circle. He was then sentenced to death, but the Tsar changed the sentence to four years of punitive labor. He served his sentence in 1850-1854. This experience was later described by him in "The House of the Dead". Afterwards, he was forced to serve in the army in Siberia. In 1857, he married Maria Isayeva. He was allowed to retire only two years later. At first, he authorities allowed him to move only to the city of Tver. That same year he published two novels, "Uncle's Dream" and "The Village of Stepanchikovo". He was finally allowed to come back to St. Petersburg only in 1860. At the time, Dostoyevsky was in great need of money. To support himself, Dostoyevsky and his brothers Mikhail started editing the journal "Time". The magazine quickly became popular and provided a decent living for both of them. In the magazine, Dostoevsky was able to publish his novels "The Insulted and Humiliated", "The House of the Dead" and the short story called "A Nasty Story". After the death of his wife Dostoyevsky went to Wiesbaden in Germany. There, in 1866, he started writing one of his best-known novels, "Crime and Punishment". 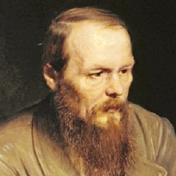 Dostoyevsky described the central idea of the novel as follows: "The criminal is faced with unsolvable questions, unexpected and unsuspected feelings torment his heart. God's truth and Earth's law prevail in the end, forcing the criminal to do himself in. He is forced, albeit through dying in forced labor, to re-join the people..." In other words, it is a true masterpiece of psychological prose. However, it can also be enjoyed as a gripping detective story. In 1867, Dostoyevsky married Anna Snitkina. That same year the couple went abroad, living first in Germany, then in Italy. Dostoevsky worked on the novels "The Possessed" (also translated as The Devils) and "The Idiot." In 1871, Dostoyevsky and his wife returned to Russia and the following year Dostoyevsky became the chief editor of the magazine "Citizen". In 1878-1879 he wrote "The Brothers Karamazov", his greatest work. He described it as a "summarized depiction of contemporary reality, of the educated modern Russia" written in the form of a family chronicle. The novel brought him worldwide fame. The psychologist Sigmund Freud (1856 - 1939) ranked it as one of the greatest artistic achievements of all time. Dostoevsky sent the last part of "The Brothers Karamazov" to his publisher on November 8, 1880, and he died soon afterward, on January 28, 1881. At the time of his death he was at the height of his career. Fyodor Dostoyevsky was a true giant of the world literature. His works have been translated into numerous languages. They are still read and studied in schools and universities. He explored and captured the depth of the human soul, and though his writing was inspired by what he saw in Russia or experienced himself, he described the feelings that every person on the globe can relate to.